When I was writing up the team previews, I was aware that with every prediction I made, I was opening myself up to being wrong. I certainly have been wrong at times, but rarely, occasionally, sometimes, I’ve also been right. When Howie Kendrick went on the DL with an oblique strain, he was the team’s hottest hitter. Normally, a team would miss a hitter on a hot streak, but this DL stint has been a blessing in disguise. Aaron Altherr has filled in for him, and he’s making the most of the opportunity. 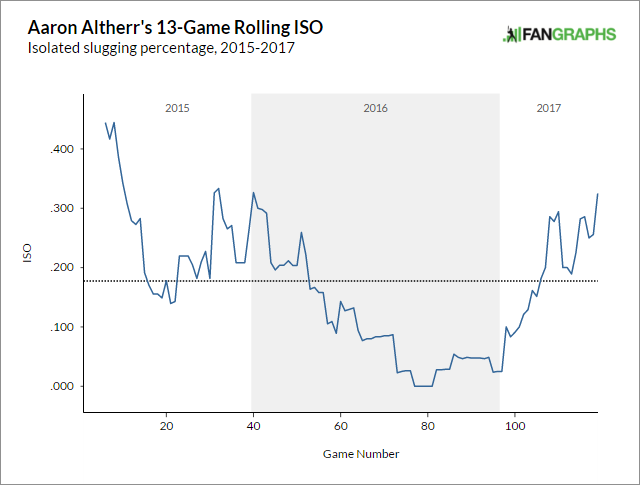 In the aforementioned previews I wrote that Altherr’s power was non-existent in 2016, but that it could have been the lingering effects of a wrist injury that held him out for most of the year. With an offseason of healing, the power has returned. Please, look at my graph. Fueled by this power increase, Altherr’s offensive numbers across the board are currently bordering on elite. Out of the 242 batters with 70 PA, Altherr’s 1.057 OPS ranks 11th. 2017 is the year of Aaron – there are two other Aarons in baseball in this sample, and both rank ahead of Altherr (Judge, 4th; Hicks, 7th). Aarons haven’t had it this good since 2001. Just for fun, I went ahead and looked at every batter with at least 40 PA in April 2017, and grouped them together by first name. With all due respect to the Justins and Mikes of the baseball world, Aaron’s April was by far the best. By WAR/600, OPS, OBP, SLG, wOBA, wRC+, and BBQ – no name comes close to what Aaron accomplished in April. Ya done good, A-A-ron. The first week in May was even better for the Aaron boyz, so I’ll be keeping an eye on this inexplicable trend. Game 24: Win, 10-2. West coast trips aren’t fun baseball. When you say “10 P.M. start time”, I hear “Bet you’re looking forward to reading about this game tomorrow”. With the Phillies moving to the more merciful Central Time Zone I was expecting a reprieve from that. The rain had other plans, delaying the game by an hour and a half. Despite the 9:30 start time, fans were able to go to bed early – the Phillies scored 7 runs in first two innings. Velasquez only allowed 1 run but was neither efficient nor effective, going 5 innings and only striking out 4. The Cubs were able to force him out early by fouling him off 28 times in 98 pitches. Yikes. Game 25: Loss, 3-8. Going into the night, Hellickson had given up 6 runs in 30 innings. It took 4 more innings for him to match his season’s total. Freddy Galvis had his hitting streak end at 13 games (although he did finally manage to walk on Sunday, ending his walk-less streak). Aaron Altherr hit another home run, his 3rd in only 57 PA to that point. Game 26: Loss, 4-5. 6 hits in the 6th by the Cubs secured the win for the hometown team. It’s been a slow start for Maikel Franco. Despite good plate discipline and a decent home run rate, his low batting average on balls in play is limiting his offensive output. Currently he ranks 22nd out of 26 third basemen in wRC+ (an all in one offensive stat), which is especially bad news for a supposed “bat-first” player. He managed to put together 3 hits in this game, hopefully a sign that things are turning around (since April 20th, he’s slashing a .279/.357/.459 line). Game 27: Loss, 4-5. May the 4th be with you. This nail biter was close all throughout – The Phillies tied the game in top of the 4th then took the lead in both the 5th and 8th, only for the Cubs to tie it back up in the bottom halves of the innings. A picked-off runner in the bottom of the 9th was crucial in sending the game to extras. The teams were deadlocked until an anticlimactic error ended it. Still, it was cool that on Star Wars Day, Freddy Galvis did an impression of his favorite Star Wars character. The marathon ended after 13 innings and 4 hours, 22 minutes, but imagine how much longer it would have been if the four intentional walks weren’t automatic! Game 28: Loss, 2-4. The Phillies lost, blah blah. That’s just a footnote here – history was made. Take a look at the following leaderboard, prior to Friday night. That is (was) a list of the most games finished without a save. 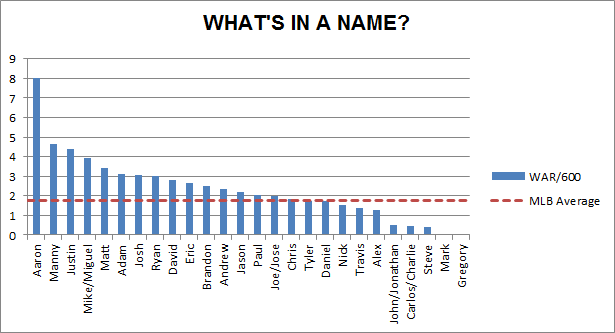 It’s a somewhat dubious list to lead – you have to walk the tightrope of being good enough to hang on in a bullpen for years, and bad enough to both not be considered for the closer role and blow any of the rare save opportunities you do get. At the top of the list, there’s Ryan Webb with 105, currently toiling away in the minors. Right behind him is (was) Matt Albers, pitcher for the Nationals. There’s nobody else even in their stratosphere. On Friday night, Albers bid adieu to his place in history and recorded his first ever career save. Only 651 to go. Game 29: Loss, 2-6. Velasquez can’t seem to put it all together. He was finally able to go deep into a game and still strike people out, but gave up 6 runs in the process. 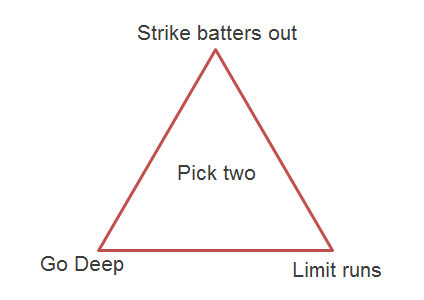 I present you with my new theory – the Velasquez Triangle. Game 30: Win, 6-5. Altherr continues his hot streak – a pinch hit 3 run bomb tied the game up at 5-5 and set the Phillies up to be the eventual winners of this contest, ending a 5-game losing streak. I don’t know what will happen when Howie Kendrick returns, but there’s no way you can sit Altherr now. Most of the time, we watch baseball to see elite athletes doing athletic things that us non-athletes can only not-do. There are times, though, that players must assume roles that they haven’t been prepating for years to do. For these brief moments, we get to see what the common man would look like if he were playing baseball on the largest stage. We got a glimpse of this last week when Yankees reliever Bryan Mitchell played first base. Orioles turned the strangest triple play I’ve seen. The box score lists it as 6-4-3, but more accurately it’d be scored “somehow no infield fly call-6-4-confused glances-uncertainty-3-confusion gives way to anger” triple play. Former Cub and dong slapper David Ross is on Dancing with the Stars, which ABC might want to consider cancelling – there’s no topping this moment in which Ross caught wind (of the broken variety) in the face. Now for something weird but touching – A Mets fan is honoring his friend by flushing his ashes down toilets in stadiums across the country. Just read it. Josh Reddick, avid WWE fan and Houston Astro, has injected some whimsy into the post-game rituals by getting a custom-made WWE belt that is held by the player of the game. The Phillies are a major league worst 2-8 over the past 10 games. In that timeframe, the team ERA is 5th worst in the National League and they have scored the 5th fewest runs in the National League. Advanced numbers (.322 wOBA on offense) suggest that they won’t continue losing at this rate. Stick with it – this is likely as bad as it will get this season. Next > Week 6 Recap: We Missed You, Chooch.